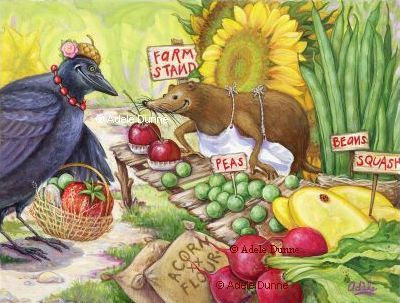 This my latest painting, called "Shrewy's Farm Stand." Shrewy is a becoming a popular character around the Whimbletails™ world! 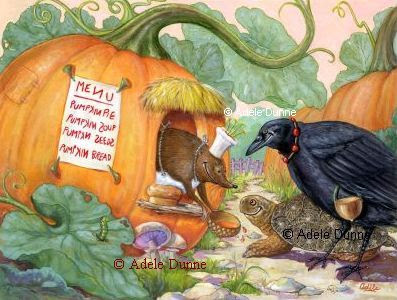 When he's not busy selling produce to his loyal customers like Mrs. Crow, he also operates the Pumpkin Cafe, dishing out such tasty treats as Pumpkin Soup, Pumpkin Bread, Pumpkin Pie, and faithfully subscribing to the credo, "waste not, want not," even the Pumpkin Seeds. See below! 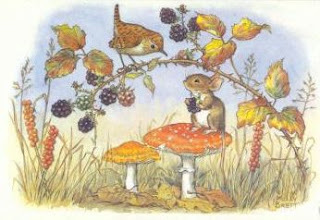 If you'd like to see the complete collection of my Whimbletails™ paintings, please go to my web site by clicking here. Molly (Mary Elizabeth) Brett was born in 1902 and grew up Surrey, Great Britain, surrounded by animals and nature. Her mother, Mary Gould Brett, was a respected animal painter who encouraged her daughter to paint from life, and this is reflected in Molly's gift for making her animals look thoroughly naturalistic while giving them human characteristics and activities. And like Beatrix Potter, her artwork also reflects her great observational powers in depicting nature, especially notable in the two illustrations above. Molly began her art training with a correspondence course in illustration, followed by formal instruction at Press Art School and the Guilford Art School. It was at Guildford that she met Margaret Tarrant (also destined to attain substantial fame as an illustrator), who soon became a close friend and lived with her in Cornwall. She began her career by illustrating "weekly papers" for children. One of her earliest commissions was to illustrate stories by Enid Blyton. Inspired by this, she went on to write and illustrate 21 books of her own for the Medici Society of London, with whom she was associated for sixty years. 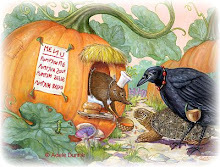 Medici has published over 500 of her paintings as postcards, greeting cards and prints. Molly Brett's work has enchanted generations of children with its beautifully drawn details, subtle colors and magical atmosphere. 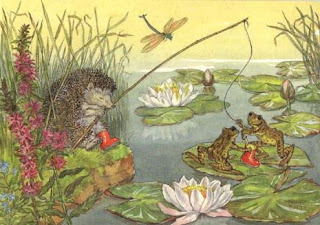 Her work follows in the tradition of other twentieth-century "dressed animal" illustrators such as Beatrix Potter, Margaret Tempest, Racey Helps, and others.